I created this project for a recent "Voxels"-themed Weekend Challenge at Blender Artists. Everything was modeled, voxelized, and rendered as is within Blender. A "matcap" (OpenGL) render pass was used in conjunction with Blender's render nodes to achieve this stylized result. 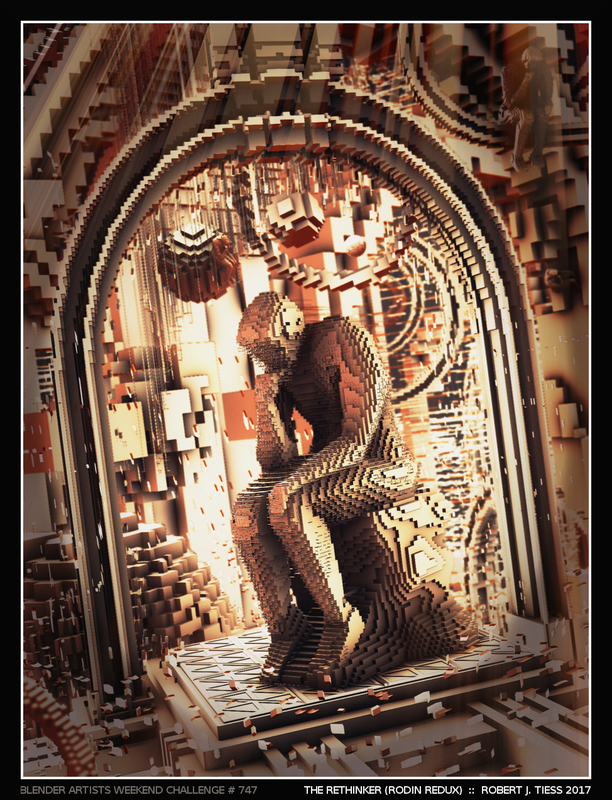 The image was, of course, inspired much by Auguste Rodin's famous Le Penseur/The Thinker sculpture - with an important difference: this thinker sits (in several spots) around the "Gateways to the Heavens" (vs. Rodin's "Gates of Hell"). There is also a bit of Escher inspiration present as well.